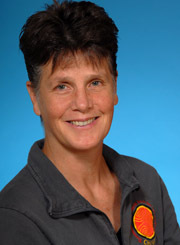 Lanoue co-founded the Womyn's Gym in the 1980s, later to become Thousand Waves. She co-founded the Lesbian Community Cancer Project. She is a cancer survivor, and lost a long-time partner ( Jeannette Pappas ) to cancer. She has been a bold advocate for women's health, and self-defense for LGBTs. She helped train some of the Pink Angels in the early 1990s. Lanoue is a black belt. She and partner Sarah Ludden are co-executive directors of Thousand Waves Martial Arts & Self-Defense Center, NFP. Lanoue states: "My own breast cancer diagnosis was in 1987, on my 35th birthday. Audre Lorde’s political analysis was a big factor in my early breast cancer activism."